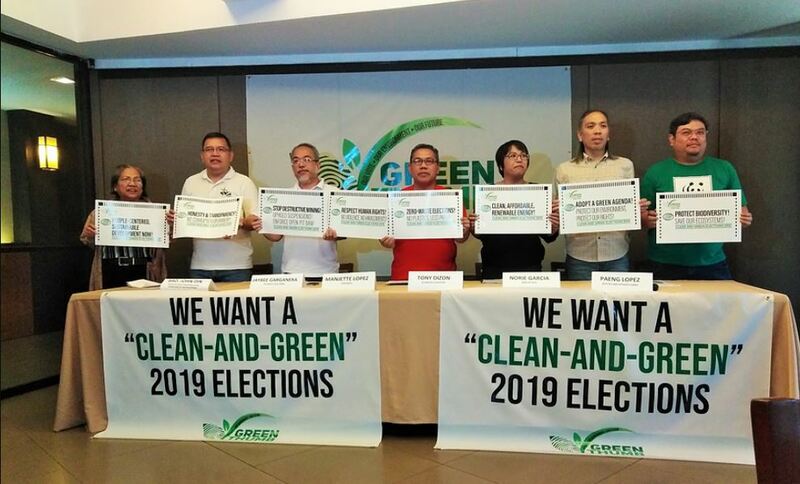 Civil society organizations gathered to call for a ‘clean and green’ election season, urging candidates to minimize waste, refrain from ‘dirty’ tactics such as political violence, as well as pledge to support genuinely positive reforms on many thematic issues on the environment, climate, and development. “The Green Thumb Coalition (GTC) – the largest network of civil society organizations working on environmental policy believes that the candidates’ commitment to advance policies promoting the environment, sustainable development, and people’s welfare is reflected in the kind of campaign candidates are running,” said Paeng Lopez of Health Care Without Harm, head of the GTC electoral campaign. “Apart from their promises, their campaign practices reveal their loyalty – or lack of loyalty – to our environment and our people,” he added. GTC called on candidates to commit to a zero-waste elections, urging them to produce less printed materials and other sources of trash, refrain from plastic banners/streamers, and utilize other means of avoiding waste in their campaign. Equally important, they also called on candidates to exercise transparency and honesty. The Coalition also encouraged candidates to align their platform with solutions to issues concerning dirty and costly energy, waste management, comprehensive land use, mining, climate justice, biodiversity, human rights, and sustainable development, collectively known as the Green Electoral Platform. Alyansa Tigil Mina (ATM) National Coordinator Jaybee Garganera reiterated the importance of political will in pursuing meaningful change in many areas of environmental policy. “The protection of our rich ecosystems and biodiversity, as well as reforms in fishing, forestry, mining, energy, waste sector, and the entirety of environmental policy is not possible if we do not elect leaders who have the heart to end the suffering of farmers, fisher folks, Indigenous Peoples, and communities who are most affected by environmentally-destructive practices,” he pointed out.